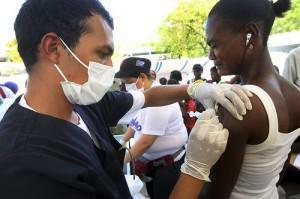 A Cuban doctor gives a patient a vaccination at a clinic for the poor in Venezuela. How bad are things in Venezuela? Even doctors from Cuba – one of the hemisphere’s most economically deprived countries – want out of Hugo Chávez's revolution. And now we know just how many are defecting. Communist Cuba sends tens of thousands of doctors and other medical personnel to Venezuela, its key South American ally. In return, Cuba gets oil at a deep discount. That was a good deal for Cuban doctors when Venezuela’s economy was healthy. But Venezuela’s own socialist blunders have brought the country to one of its worst economic crises. Shortages of food, basic products and especially medical supplies have gotten critical even by Cuban standards. Now those doctors are bolting Venezuela through neighboring Brazil and Colombia to come to the U.S. In fact, the number of defections in the past year has more than doubled from the previous year to 700. That’s according to the Venezuelan newspaper El Universal. Solidarity Without Borders, a Miami group that helps those doctors, says almost all of them come to South Florida. Venezuela’s economic woes just won’t quit. Its currency recently hit an all-time low with black market traders. Now the South American country has to ration food – and, believe it or not, import oil. Venezuela has the world’s largest oil reserves. But it produces mostly thick, heavy crude that has to be mixed with lighter oil to make it usable. Problem is, Venezuela’s seriously mismanaged state-run oil industry isn’t pumping enough light crude. So this weekend the country will receive its first ever shipment of foreign oil: two million barrels from Algeria.